The consultation includes two months of support while we determine appropriate foods and tolerated amounts for your dogs's complete diet. In order to accommodate the needs of an individual dog - in particular dogs with food intolerances and digestive issues, the process may take longer than two months, and additional support can be purchased by the month. The process involves frequent email contact between the dog owner, Monica Segal/ Jody Zesko. Please keep in mind that we are not available on weekends. We cannot always incorporate commercial foods for dogs with health challenges. Please contact us to discuss if this is a concern. If you have doubts on which consult is best for your dog, please email customerservice at monicasegal.com before booking. Please note: The time frame for our waiting list changes weekly. Current waiting list is 4 weeks from the time we receive complete replies to the intake questionnaire you will receive. You will receive a form via email within 48 hours of placing an order. Please complete this form and return it to us within 1 week.A $50 fee is applicable if a client cancels the order prior to the diet formulation being done.Cancellation of consultations less than 48 hours after the start of formulating a diet has been done will be considered a diet formulation and charged $180 accordingly. Cancellations after that time are not refundable. This consultation is the best way of addressing those dog with health concerns and special needs. From the time he was 10 weeks old Taser has had GI issues. We had him blood tested for allergies at age of 1, we now know the whole process is bogus, and followed what showed up on his report for almost 3 years. In that time, we changed foods I don’t know how many times as he would improve on something new and eventually crash. His calorie requirement was also incredible for a dog his size, but we always assumed it was because he was so active and his brain just never shut off. Sometimes we had weeks on a new food, sometimes months. He picked up giardia and that pretty much did in his entire system. It took a good 6 months and lots of metronidazole to get him back on track. He was under veterinarian supervision but I started researching and found Monica’s site. We had also kept him on a high protein diet because he was so incredibly active and thinking then was that that’s what you did. That also turned out to be all wrong. After reading through just some of Monica’s info, we started our own process of elimination, -food wise - and it ended up that the allergy test was almost the complete opposite of what Taser couldn’t tolerate. He also developed environmental allergies that complicated the whole process. Once we knew what he could tolerate, I contacted you to get his diet balanced. I had also read something about how lowering protein could sometimes benefit hyperactive dogs. Since Taser’s brain was like a hamster wheel spinning out of control it was worth a try. Since being on his new diet, his GI issues had settled right down. We still have the odd hiccup but we can deal with hiccups. For the first time in his life he actually gained weight and we assume he was finally able to actually absorb the nutrients from his food. His calories actually had to be reduced a little. Our once hyperactive little dog is still incredibly active, but his brain now functions where he can actually think. Turns out that once we lowered his protein a little, the hamster wheel slowed to medium speed and we have an awesome little dog in there. S. E.Ayton, ON I just wanted to share an update on Linnie with you. She’s continuing on the diet you designed for her, and her protein/creatinine ratio numbers have continued to improve! Needless to say, the vet and David and I were extremely happy over the latest reading of 1.5! There have been no other medication changes so the improvement is definitely due to the diet change. Also, the vet had been concerned about dropping albumin levels, but that improved as well. We’re continuing on. Linnie turned 10 in August and, overall, is doing well. She passed her Barn Hunt instinct test in October, and I’ll enter her for Novice…once I teach her what the word “tunnel” means! 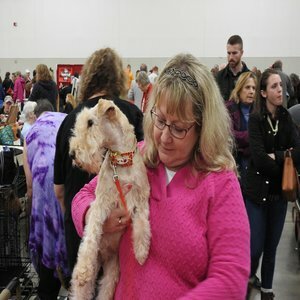 :) This weekend she will be representing her breed at the Lakeland Terrier breed booth at the Wisconsin Dog Fair. Thank you again for sharing your expertise with us and helping us to get Linnie Bean on the right track! 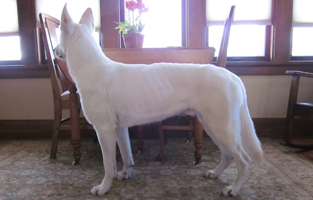 Shani AtkinsWI, USA Chip has been on a diet formulated for him by canine nutritionist Monica Segal. Over four years ago a cardiologist at Angell gave him a year at most until heart failure, and then a few more months. That's when I contacted Monica and started the diet. As of today Chip is still not in heart failure! And he likes his food, formulated with ingredients he enjoys. I want to thank you for always being available and helpful--and in my mind, Jack's special diet has helped get him through this ordeal and has made ME feel like I'm taking an active part in his care! (despite my cooking abilities :) Here's to all you do for the dogs and people of the world :) Hello to your very special girl, too. 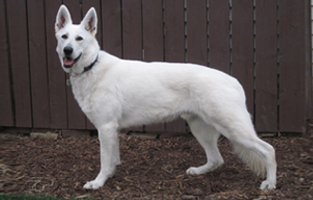 Cindy HainesTraverse City, Michigan Words cannot even begin to accurately describe the gratitude I have for Monica, which is why it has taken me months to write this testimonial after a long, determined journey she and I have taken together to get my White Shepherd, Oscar, in better health. His GI tract was like a wild rollercoaster, which made every rib bone, backbone and hip bone stick out of his beautiful white fur. I came across Monica Segal on a GSD forum. Several people recommended her books and services when I was posting about how frustrated I was with Oscar's recurring GI problems. After months of staring at her website with Oscar by my side, I finally found myself hitting the "Add to Cart" button to buy a 2-month Adult Dog Consultation. In hindsight, I don’t know what took me so long. It has easily been the best money I’ve spent on one of my dogs – and I knew it 2 weeks into working with Monica. Monica is driven – “passionate” would be an understatement. She lives and breathes canine nutrition and is one of the most responsive, professional and caring people I have ever met – not just in a dog-related profession, but in my entire life. The support she has offered me through the entire process was nothing short of amazing. Oscar has turned out to be one of her toughest cases, because he just would not gain weight. We went back and forth for months and became friends through the entire process, and Monica became "Auntie Monica" to my special boy. What astounds me most is Monica’s incredible, personal approach. Her commitment to her clients is phenomenal. She has helped Oscar go from a 57-pound skinny wienie to a 74.5-pound gorgeous young man who has never been so healthy. Thank you, Monica, for helping our family in ways that only you could have and for never giving up on Oscar. Laura Hackbarth(WI) I'd heard great things about Monica's work and had purchased and used a few of her pamphlets. Monica joined our "care team" via an adult dog consultation in the fall of 2010. 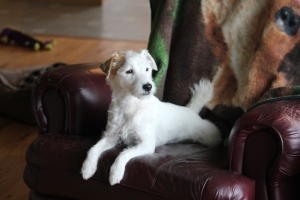 My Jack Russell Terrier (REO) had a history of allergies then we found urinary crystals (spring 2010) and by fall he had urinary stones removed (calcium oxalate). We knew we HAD to make some changes to his diet to help with not only the allergies but now the calcium oxalate issues! The process for the consultation was smooth and SO educational! Thinking through and filling out the questionaire prior to the consult made me really think about cause and effect REO had been trying to tell me. I loved the step by step approach. Introducing incrementally meant when REO had a negative response we could ID what didn't agree with him quickly and adjust accordingly. The ongoing communication with Monica was amazing! REO threw us some curve balls! Most (if not all) were probably run of the mill for Monica but they weren't for me! Monica was there to talk me "off the edge"; providing a supportive ear, explaining the pros and cons of our next step "options", and then developing the game plan for the upcoming days/weeks. In the end we discovered REO also has a digestive disorder but even as the list of health issues grew Monica kept on top of it and pointed us toward a plan. Oscar is very handsome, super-high energy, and has a GI challenge. The GI issue was settled quickly with a diet change, but getting those poor bones covered was another story. Oscar's mom Laura, and I are a stubborn team, and we stuck to our guns. Just look at Oscar now! From a skinny 62 pounds to perfect 74.5 pounds. Thanks Laura. You were just wonderful to work with, and I will always remain Oscar's "auntie" in my heart.